I’ve always admired origami. Without the benefit of scissors, a small square of paper is folded again and again, until something familiar takes shape. Gradually, that shape becomes something remarkable, such as a crane. Similarly, and with the same loving care, the filmmakers of the company LAIKA Animation have crafted Kubo and the Two Strings, without the benefit of shortcuts of any kind. They have produced a work of art with countless layers of meaning. First and foremost, Kubo and the Two Strings is a story about storytelling. Every character has a story to tell in this film, but the protagonist Kubo, a child of eleven, is the most powerful storyteller of all. Kubo uses the magic of his stories to captivate a village. His powerful words magically animate paper as he plays the stringed shamisen, creating an enactment in origami of the story playing out in midair. His own story is full of magic, and heartbreak. Kubo cares for his mother, whose memories and sense of herself ebb and flow like the tide near the cave where they take shelter. When she is lucid, she uses all her magic to protect her son from eminent danger: her own sisters, and father, seek to kill her and harm Kubo. The boy’s own grandfather, a powerful spirit being, stole Kubo’s eye when he was just a baby and killed his warrior father. Meanwhile, his aunts, horrible witches, want to take Kubo up to the heavens with them, where they can seal themselves off from the humanity they despise. Danger eventually finds Kubo. On the run from the witches and his grandfather, he must find his late father’s magic armor if he is to save himself and vanquish the otherworldly evil. He is not alone in his journey: a monkey brought to life from a charm given to Kubo by his mother, and a beetle with samurai skills, accompany Kubo on his hero’s journey. 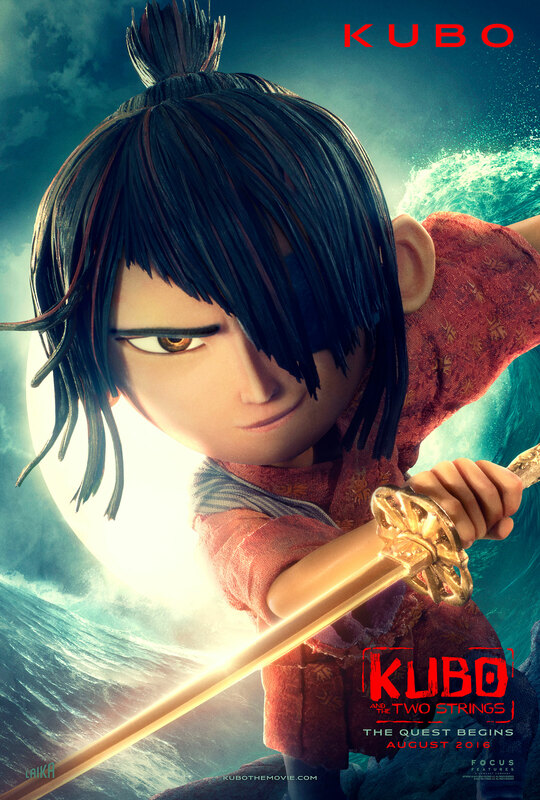 Along the way Kubo realizes his deep connection with his past, his reverence for his ancestors, and the power of his memories, kept alive through stories. This is far more than any average protagonist of a children’s film accomplishes. This is what makes Kubo and the Two Strings extraordinary. The fact that every element of every frame in this movie is crafted by hand gives us all the more reason to marvel at the finished product. It might not be a traditional narrative, and it’s certainly far from formulaic, but it’s one that can be appreciated by the young, the old, and everyone in between. LAIKA’S previous films include Coraline and Corpse Bride. The films feature darker story lines than your average children’s films. Some of the battle scenes in Kubo are epic, intense and violent, and are probably too scary for very young viewers. I recommend the movie for ages seven and up.